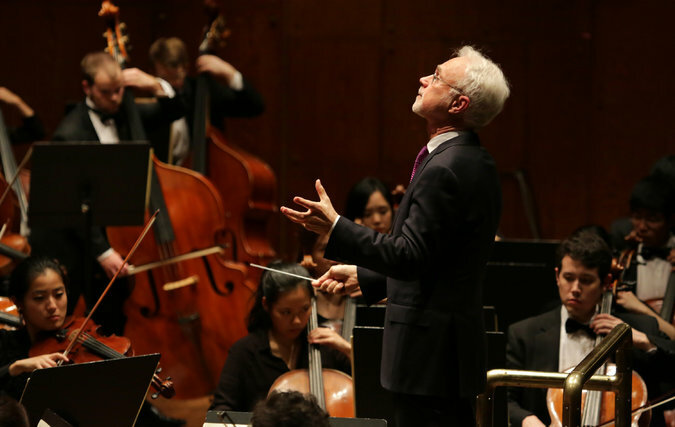 "A terrific concert… The Brentano played with a judicious blend of command and spontaneity. The young orchestra musicians looked and sounded inspired." Given the hostility that the production of “Klinghoffer” has aroused, it must have been a relief for Mr. Adams to be doing something as central to the daily lives of musicians as performing a Beethoven symphony. The performance, though, was anything but ordinary. This was a bold and vigorous account of the work, which Mr. Adams conducted from memory; he drew spirited and technically impressive playing from the Philharmonia, the Yale School of Music orchestra. A restless, continuous piece of nearly 25 minutes, “Absolute Jest” is a kind of concerto for string quartet and orchestra. The solo ensemble on Sunday was the excellent Brentano String Quartet, which this summer began a residency at Yale, following the Tokyo String Quartet, which had held that position for 37 years, until it disbanded last year. Before leading “Absolute Jest,” Mr. Adams spoke engagingly about the piece and had the Brentano players perform excerpts from some of the Beethoven Mr. Adams borrowed, which was very helpful. The resulting work is pulsing, fidgety and fractured. Yet it unfolds with breathless sweep and sounds like Mr. Adams through and through. At times, repetitive riffs from Beethoven are turned into musical battering rams. Elsewhere, a short lyrical line from Beethoven begets a transfigured passage of hazy harmonies. The Brentano played with a judicious blend of command and spontaneity. The young orchestra musicians looked and sounded inspired.